Matterley Basin was again a stomping ground for Rockstar Energy Suzuki World MXGP and Clement Desalle this weekend as the Belgian threw his Factory RM-Z450 to second position overall – after a race two victory - in front of 25,000 spectators at the British Grand Prix and the eighth round of 17 in the FIM Motocross World Championship. The Winchester venue had been liberally coated with rainfall in the build-up to the GP (shifted from its usual August slot to a Bank Holiday weekend date in late May) and was again hit by showers throughout Saturday to create a damp, grippy and technical terrain. It was a surface on which the riders revelled; none more-so than Desalle who set the pace from the very first laps of the meeting. Desalle strode ahead to a dominant Pole Position on Saturday that was essentially a re-enactment of his superiority from the previous round in Spain two weeks ago where the Belgian went 1-1 in the motos for his second overall triumph of the season. Operating on a favoured stage and one in which he was victorious in 2013, Desalle was second out of the start in the first moto that was run under sunny skies and across a ground that was rapidly drying. He then suffered from a crash that pushed him outside the top five and from where he had to work hard to recover to fourth place. The ‘Desalle from Saturday’ returned for the second moto and although he faced a little pressure from Antonio Cairoli at one stage deep into the 30 minute and two-lap duration, the 24 year old kept clear and earned his third chequered flag from the last four. His 4-1 scorecard meant the second step and his fifth trophy of the season. Kevin Strijbos took his time to find a decent feeling on the Matterley mud on Saturday and entered the gate with ninth position. The Belgian wanted better for Sunday but ‘so-so’ starts were a slight handicap. He raced to fifth in the first outing and was quick and aggressive to edge into the same position during the second moto but a slow speed crash dropped him to seventh where he continued until the finish. Strijbos classified sixth overall. As the 2014 season effectively reaches the halfway stage, Desalle sits second and 28 points away from the red plate as MXGP series leader. 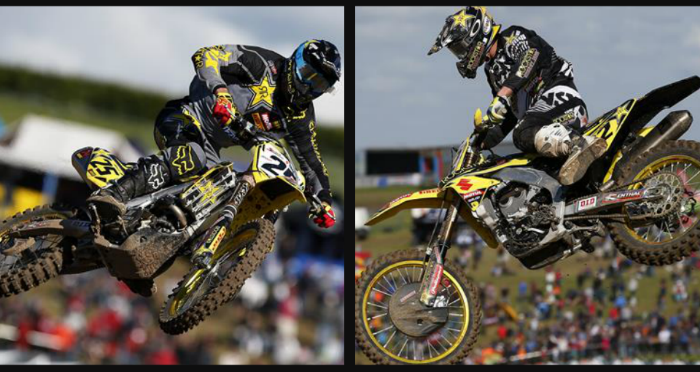 Strijbos, meanwhile, gives the team two riders in the top four as the 28 year old rests fourth. Rockstar Energy Suzuki World MXGP will now pack-up swiftly and head back to HQ in Lommel before journeying into France and to St Jean d’Angely for round nine next weekend.